Very often one needs cartographic information at the location one is currently at. 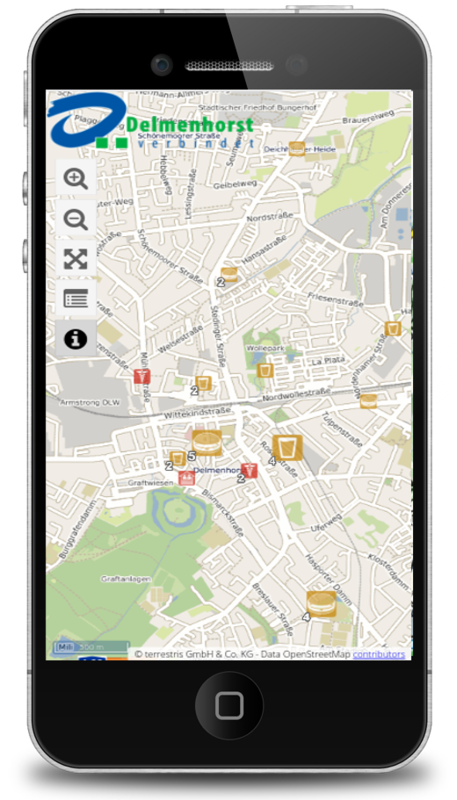 This is why we have developed a mobile WebGIS client for Smartphones and Tablet PCs, that is optimised for small screens and the touchscreen gestures. Our mobile client is based on OpenLayers und GeoExt3 and supports all major mobile devices. In contrast to the “apps” that are common for smartphones our client is loaded into the standard browser and does not have to be installed. Through this we are following the trend towards browser based mobile applications since these depend less on the hardware being used. Theme selector: All services supported by OpenLayers (i.e. WMS, OSM, Google) can be integrated. Geolocation: The geolocation component with access to the local GPS allows you to show your current location on the map. Other functionalities and special needs can of course be implemented.